Looks cured enough. Have you tried letting some dry in the house before trying? That’s the main secret of willow: Getting it, and keeping it dry. NWPrimate, tristndad, Draketake and 3 others like this. Got four unique hand drill embers tonight. I found a piece of beargrass (Nolina sp) stalk in my stash that was thick enough to make into a hearth. I have never used beargrass as a hearth (except for an earlier attempt to use it via the two-stick method unsuccessfully). Therefore, all four embers I got tonight counted. Cottonwood root spindle on beargrass (Nolina sp) hearth. Prickly lettuce spindle on beargrass (Nolina sp) hearth. Red osier dogwood spindle on beargrass (Nolina sp) hearth. Sunflower spindle on beargrass (Nolina sp) hearth. Medicine maker, OMRebel, Forestree and 9 others like this. Nice. Is that a cannabis hemp cord? tristndad and PrimitivePotato like this. Here's a fun trick I just thought of today, inspired by people burning their sets to encourage making and using new sets/woods every time. 2. 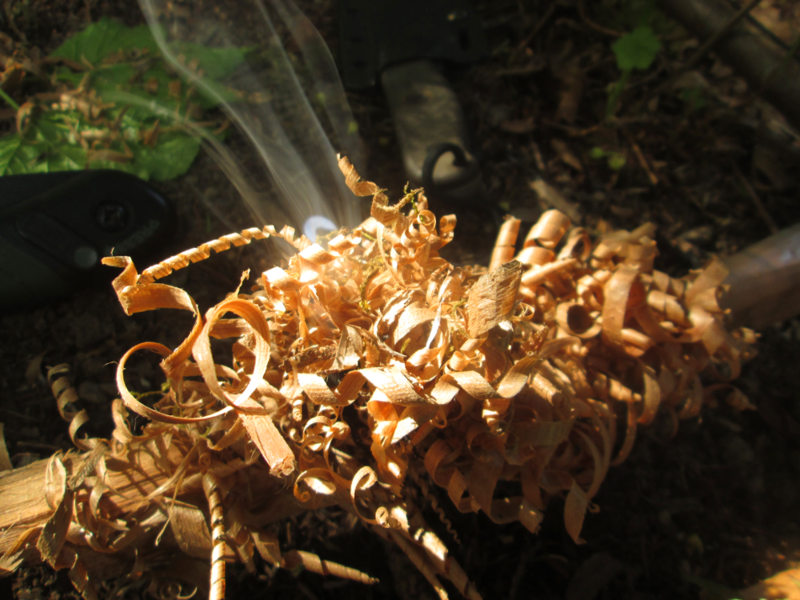 Use your spindle to make a feather stick while your coal smoulders. 3. Insert coal into feathers and blow to flame. I did it today with staghorn sumac, but I didn't videotape it. Next time! Forestree, rsnurkle, cockeyedhunter and 5 others like this. Forestree, rsnurkle, cockeyedhunter and 7 others like this. Of couuuurse youve already done it @NWPrimate. Haha. I probably got the idea subconsciously from your vids. You should give it a name - the "forgot your tinder bundle" drill. rsnurkle, tristndad, NWPrimate and 4 others like this. Four unique hand drill embers today. Hollyhock spindle on beargrass (Nolina sp) hearth. Mullein spindle on beargrass (Nolina sp) hearth...with an introductory cameo appearance by Excalibur, brought yesterday by the Knife Faery...in this case, the Lady of the Lake. Narrowleaf yucca spindle on beargrass (Nolina sp) hearth, with Excalibur. Rose spindle on beargrass (Nolina sp) hearth. Thanks to @Jacob for both the narrowleaf yucca and the beargrass. And thanks to the Knife Faery. Also, thanks to (I believe) @CivilizationDropout for the rose. BBizy, Medicine maker, Forestree and 9 others like this. Forestree, rsnurkle, Guillaume Longval and 6 others like this. Good job! I find shorter spindles are more difficult to use than the long ones. rsnurkle, Guillaume Longval, tristndad and 4 others like this. Bubbles, rsnurkle, Guillaume Longval and 4 others like this. Medicine maker, Forestree, Lil Bullits and 10 others like this. No pictures (yet) but, yesterday (Tuesday in Japan!) I gave hand drill a go with Palownia again. I can do bowdrill, but I'm seriously bad at hand drill -- just can't get enough downwards pressure. I learned to cheat just enough to get a bit of smoke and brown-grey dust though! I made the head of my spindle about 3/8" in diameter, and with that, was able to get smoke and a bit of char. I also used water on my hands to increase grip. I think with a bit of practice I might be able to make this material work. I need a thicker baseboard, though... This palownia is really soft and I drill through it extraordinarily fast with such a small diameter spindle. Forestree, PrimitivePotato, Bubbles and 10 others like this. Here is a posture I like that uses physics to provide downward force on the spindle. It allows body weight to contribute to the downward force. If this looks familiar to some of you old timers, it's because I posted it at least a couple times in the past. BBizy, Medicine maker, Forestree and 11 others like this. Blackberry spindle on beargrass (Nolina sp) hearth. Blackberry spindle on Cottonwood root hearth. Thanks to @tristndad for the blackberry, and @Jacob for the beargrass. The blackberry canes came cut to about a foot long and were rubber band bound to a dowel that successfully kept them good and straight. But attached to a blackberry cane bundle was the boxed Boker pen knife! That was very unexpected and I am very pleased. Thank you @tristndad. Must be my week...The Knife Faery delivered me a knife via The Lady of the Lake while ice fishing on Saturday, which I call Excalibur. Yesterday I got this Boker attached to a bundle of blackberry canes, and I'm gonna call it "Excalibur's Little Brother." Thanks again, all. BBizy, Medicine maker, OMRebel and 11 others like this. The only issue I had with the blackberry cane I was using was that it split, but not before giving me a couple of embers. Even then, I was able to trim the broken part back and start anew. OMRebel, Forestree, Bubbles and 8 others like this. I let it dry for a bit in the sunshine on my signal panel. Beat up some willow bark for the tinder bundle. Medicine maker, OMRebel, Forestree and 10 others like this. Medicine maker, OMRebel, Forestree and 8 others like this. WooHoo! That sure is a wonderful feeling when you get that first ember. Believe it or not, the thrill only lessens a little after you get hundreds more. BBizy, rsnurkle, PrimitivePotato and 4 others like this. Two more unique hand drill embers tonight. Blackberry spindle on desert willow hearth. 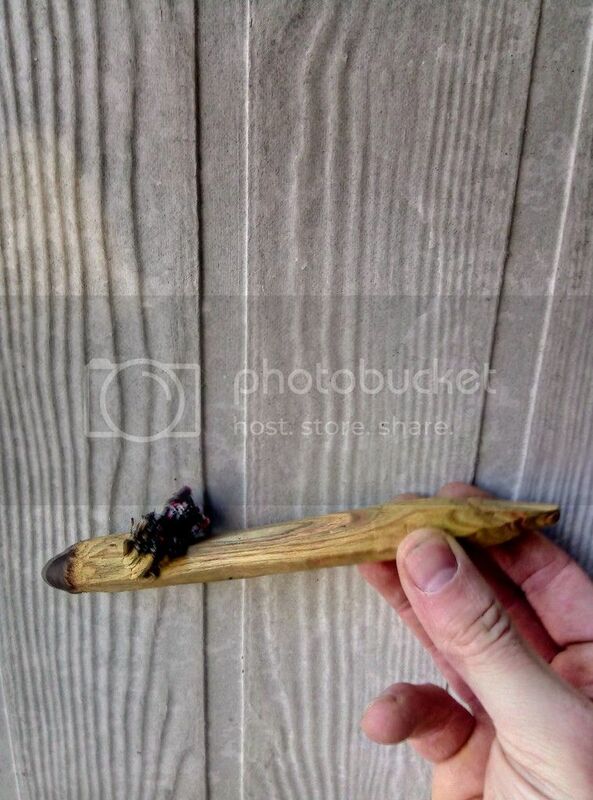 Blackberry spindle on saguaro rib hearth. Special thanks to @tristndad for the blackberry and to @Jacob for the desert willow and saguaro rib. Lots of smoke on pin cherry, vine maple and tulip poplar, but couldn't quite get them to ember up today. BBizy, Medicine maker, Jacob and 8 others like this. It was a good feeling, but I don't think anything will ever beat that first hand drill ember. Is there any pieces of the blackberry you think you can use as a hearth? I'll keep my eyes open for some thicker pieces for you. BBizy, NWPrimate, ArmyMacE and 2 others like this. Have you gotten that first hand drill ember yet? I think maybe the big bulbous portion by the root crown would be good if the plant has such. That is all I can think of, unless it works as a two stick hearth. Let's ask @NWPrimate who lives over in the land of the giant blackberries for his opinion on this. BBizy, PrimitivePotato, tristndad and 3 others like this. Yes on the hand drill ember. I have been consistently getting one with mullein and cedar. I'm struggling with other combos though. BBizy, PrimitivePotato, NWPrimate and 2 others like this. @Stone very cool sir. I am definitely lacking in the skills of friction fire. PrimitivePotato, Stone, tristndad and 1 other person like this. Other than Yucca for hand drill. BBizy, Forestree, PrimitivePotato and 3 others like this. Practice! That will fix it! PrimitivePotato, Stone, Guillaume Longval and 2 others like this. So far...no luck with any of the blackberries, but I'd guess it's possible. Black cap (Rubus occidentalis) makes a good hand drill spindle though. You and @Guillaume Longval are the only people I know who got an ember with a hand drill before getting one with a bow drill. Pretty amazing. PrimitivePotato, ArmyMacE, NWPrimate and 2 others like this. if i remember correctly, i got a bowdrill ember before my first hand drill, but i did find the later easyer at first... until i figured out multiple wrap and that i could put sap in the bearing block. @tristndad , if you got your first ember out of a hand drill, it must have been quite the emotion! PrimitivePotato, tristndad, ArmyMacE and 1 other person like this. 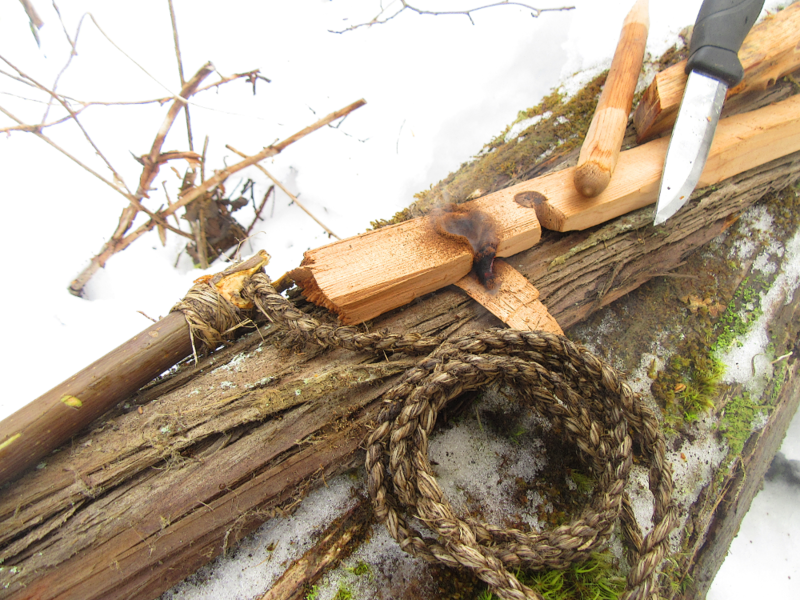 Cedar on cedar with cordage made from dead cleavers. Medicine maker, Jacob, Forestree and 8 others like this. NWPrimate, PrimitivePotato, tristndad and 2 others like this. Here is my post from that first ember. You can tell I was just a wee bit excited. Ok! I know it's not Tuesday, but holy Frickin Crap! I did it tonight!!! Been trying for years off and on with a handdrill, with no success. Been practicing alot for a few weeks now, actually had an ember on the end of my spindle twice. Tonight, 100% complete success, and it feels awesome! I know it's a crappy picture, but I was to excited to hold my camera steady. Thank you to this great forum and it's amazing people. This place goes above and beyond with helpful people and the knowledge they share. @NWPrimate your building an ember thread was amazing. 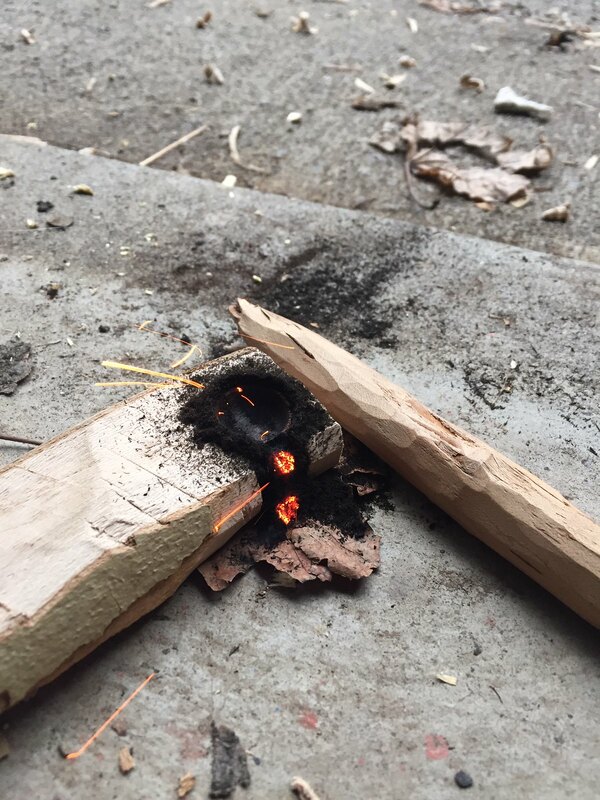 This "Friction Fire Tuesday" thread and all of the people who have participated in it-Thank You so much for all of your knowledge. Sorry, I'm feeling a bit overjoyed at the moment, cause I did it! I got 2 embers yesterday with the bowdrill. I experimented today with blackberry with no luck. I feel it's doable for me, just going to need to steady up the bearing block a little more, I tend to roll it a little and it ends up catching the wood fibers. A little more practice and I bet I will get one. Went back to my yucca spindle for today's ember. I can't wait for a little free time to get out in the woods to start my first fire with the bowdrill. Going to have to plan a feast to be cooked over that fire for celebration. Hope everyone has a good week and keep making those embers! BBizy, Medicine maker, Guillaume Longval and 6 others like this. My son came for a visit today. He is home from school for spring break. As awesome as it has been getting my first embers with the hand and bow drill, it doesn't compare to watching my son get his first bowdrill ember. We spent a solid 2 hours today working on our friction fire skills. He came very close with the hand drill and now has the technique down. He did manage to get a bow drill ember after some practice. I sent him on his way with a few spindles and a cedar hearth board so he can keep practicing at school. Hoping to make him a bow drill set before he leaves. Here is a picture of him with his first ember. So with aging knees, two hours of friction fire practice doesn't feel so good on them. Had to give them a good soaking! Thanks everyone for the knowledge you all share. Stone, Guillaume Longval, Forestree and 4 others like this. great job with the son! Stone, rsnurkle, Guillaume Longval and 3 others like this. BBizy, Medicine maker, Stone and 8 others like this. I live in the north east, and grow yucca in a garden. I am not sure of the variety, I inherited it with the property I bought about 4 years ago. Every couple of years I get some decent flowers. 2 years ago I harvested one of the straiter flower stalks to try and use for a hand drill. I spent a lot of time practicing with it, coming very close to getting an ember with it, but it never happened. Anyways, It's a little to short now for the hand drill, but is awesome for the bow drill. I cut it in half so I have 2 of them. My question is when I see people posting bow drill yucca spindles like the one above by @Forestree you guys are able to carve them to a point on the bearing block end. I can not do this, because the yucca I harvested has too much pithe and not enough woody material around the outside. Is that not a typical characteristic of yucca, and my variety is a little unique? Is there a trick that someone has found for any species with the same physical characteristic. It is the same thing I run into trying to use blackberry as a spindle or even mullein, too much pithe and not enough wood. Any thoughts would be appreciated. Medicine maker, Stone, rsnurkle and 1 other person like this. Medicine maker, Forestree, rsnurkle and 6 others like this. Trying to get back into practice with pre-dried salmonberry on cedar. Medicine maker, Forestree, ArmyMacE and 6 others like this. BBizy, Medicine maker, Forestree and 6 others like this. Yucca, mullein, sunflower and other pithy stalk that make outstanding spindles don't hold up to 'standard' treatment of pointing the bearing block end. Yet they remain excellent bowdrill spindles. To hold them together just ROUND the bearing block end and use a bearing block to match that. I like either a seashell or a piece of cottonwood bark. I understand locust bark works, too. 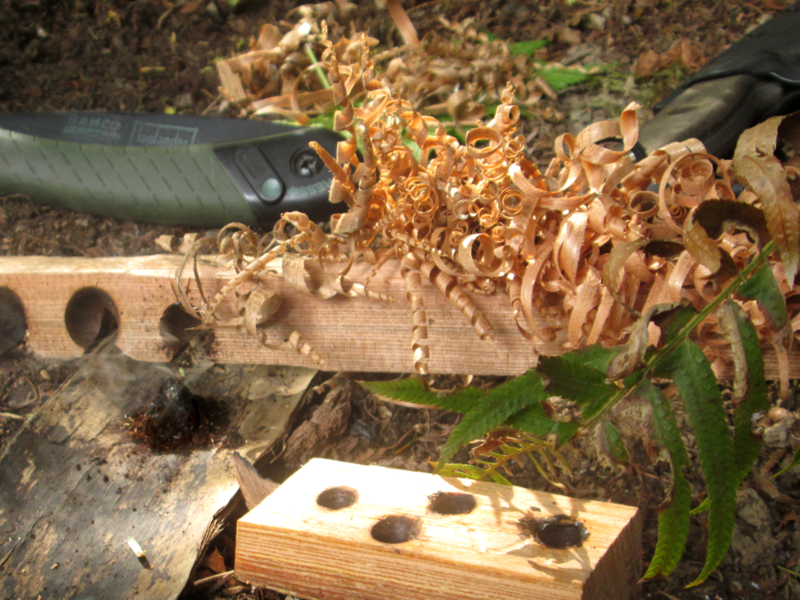 I have made cottonwood bearing blocks by getting a piece of thick bark from a deadfall, carving it to hand shape (i.e. computer mouse shape) and start a rounded hole in the bark. The spindle will grind out what it needs, smoke a little and then be just dandy. I even saw one guy online who took the trouble to splice a harder tip onto the bearing block end of a mullein stalk and use that. BBizy, Ivan, NWPrimate and 5 others like this. Thanks @Stone! I have been experimenting alot since I posted that question. I have found a stone with a nice wide rounded hole in it that works well with the pithy spindles. I also started using a beeswax that still has some honey in it inside the bearing block. I slowly heat the spindle up wich helps work the wax into the pith. It seems to give a little more structural integrity to the soft pith. It's a little sticky for the first couple of spins, but then starts to work more like a lubricant. I'm enjoying the bow drill, but I think my passion lies in the hand drill. Ivan, NWPrimate, Guillaume Longval and 2 others like this. That is where my passion lies as well. NWPrimate, Guillaume Longval, rsnurkle and 1 other person like this. Two unique hand drill embers today, after quite the workout. Blackberry spindle on California buckeye hearth. Blackberry spindle on mule fat hearth. Thanks to @tristndad for the blackberry and @Gruntinhusaybah for the mule fat. 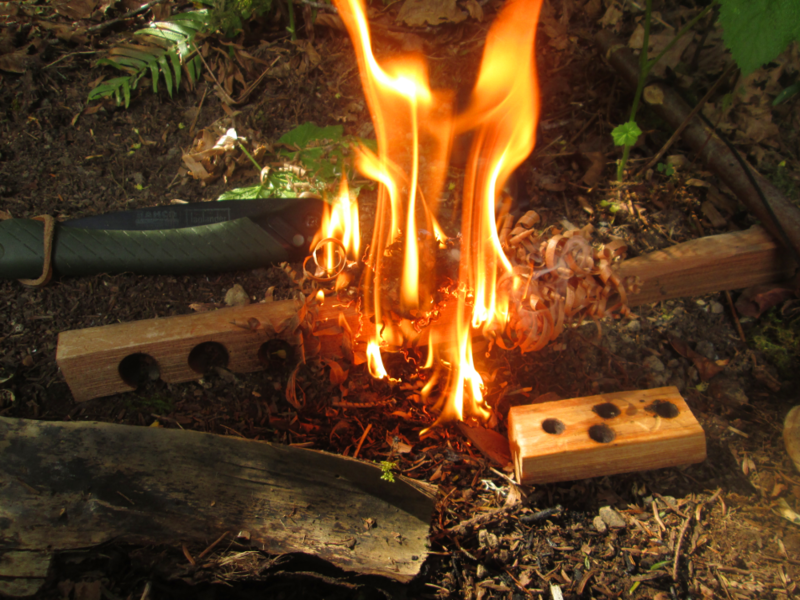 It's been nine days since I last played with friction fire--I've been playing with ice/snowmelt for that long. 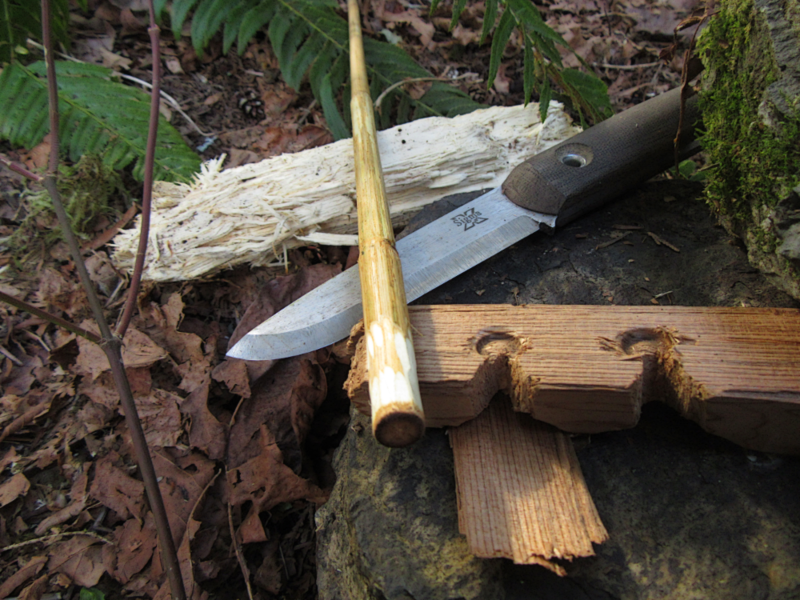 But today I got fails using blackberry on yucca, balsam fir, and western red cedar. I think all those failed woods were too soft and I bored through them before I could make an ember. BBizy, rsnurkle, Medicine maker and 6 others like this. I got three unique hand drill embers tonight. 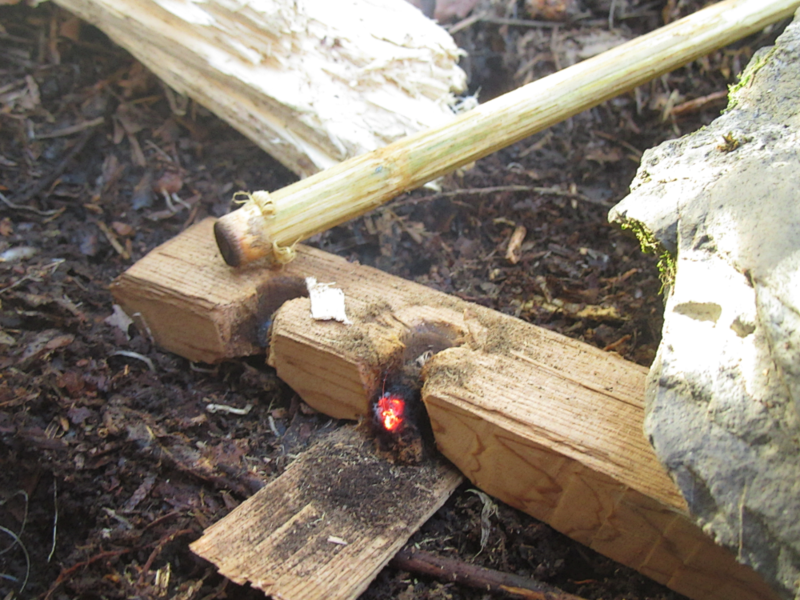 I followed my hunch (see post 8944) and used harder woods so they wouldn't bore through before producing an ember. Blackberry spindle on cliff-rose (Purshia sp.) hearth. Blackberry spindle on palo verde hearth. Blackberry spindle on peach hearth. Thanks to @Jacob for the cliff-rose and palo verde, and to @tristndad for the blackberry. That's nine embers so far on the blackberry spindles. rsnurkle, Medicine maker, Ivan and 3 others like this. The best practice I had for becoming proficient/confident and fast with flint and steel fire starting is when I started fire every day in the fireplace using that method. That was daily for a winter in Utah. That was before I was using friction fire, but starting home fires daily with friction fire would have been a real incentive early on. I've never had much luck using stones for bearing blocks. Those I tried were so coarse they would not only noticeably slow the spindle, they would also grind it down a lot! Close to that, however, is making one out of clay or ceramic...just a biscuit with a dimple in it. The fine grain of the clay doesn't grind so aggressively on the spindle. Glazing and firing makes it smooth, too. Guillaume Longval, rsnurkle, Ivan and 4 others like this. Three new hand drill embers before dinner tonight. Black locust spindle on alligator juniper hearth. Black locust spindle on black walnut hearth. Black locust spindle on Rose of Sharon hearth. Thanks to @Jacob for the alligator juniper, and thanks to @OMRebel for the Rose of Sharon. Notice there was some borer activity in the walnut...that is supposed to be a good thing to look for in friction fire materials. BBizy, Guillaume Longval, rsnurkle and 5 others like this. At one point in time, someone who owned my property before me had put some really wild stones under the garage eaves to help with run off. I don't believe they are native to my area. Its really a neat variety though and even includes seashells. The stone I found for a bearing block is almost glass like. It is a clouded white color. It's quite smooth and came with a natural divet in the middle of it. I took another smaller stone with a point on it, and cleaned it up a little. It's been working well for me. I wish I could tell you what kind of stone or mineral it is, but sadly I am a bit behind in my geology skills.